Being an eminent company, we are involved in rendering Diesel Engine Overhauling Service. We offer overhauling services related to engines. We provide these services for reputed companies. We have inhouse facitlity for machining of diesel engines plus trained engineers for overhauling the same. We also provide backup support through trained service engineers as and when required. We provide Caterpillar Engine Overhaul services. In this we provide service of repairing of crankshaft, Engine Block, Connnecting Rods, overhauling, rebuilds and other tasks. Our company is widely appreciated in providing All kinds of Diesel Engine Overhauling Service. Like as : Skoda, SKL, Cummins, MAN, Caterpiller, from 100 KVA to 2 MW. P. K. Engineering & Co.
Diesel Engine Overhauling, An overhauled engine is an engine which has been removed, disassembled. (torn down), cleaned, inspected, repaired as necessary and tested using factory service manual. The procedure generally involves honing, new piston rings, bearings, gaskets, oil seals. Electrical machineries are manufactured using materials that age by time. As insulation materials age, they lose their insulation value and would eventually cause the machinery to break down. - Preventive Maintenance of Diesel Engines and Generators. - Annual Maintenance Contracts (AMC). - B, C, D, and E Check as per Maintenance Standard (i.e. 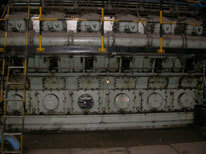 Kirloskar Cummins). - Overhauling of Engine at site (i.e. in ships or factory). - Job work and Re-con Assemblies to minimize down time of equipment (only for Cummins make Engines). While operation, engine will have normal wear and tear based on the operation practices, load pattern and duration of operation. The in-frame overhaul or major engine overhaul is normally dictated by the following attributes based on which it is decided whether engine is in need of an in-frame overhaul or a major overhaul. We have handful of experience in docking and repair of merchant ships. Diesel engines overhauls are done by group of specialist. Maintenance, repair, troubleshooting and service of large marine diesel engines including both two and four stroke diesel engines are undertaken by us. We offer overhauling services related to engines. We provide these services for reputed companies like: Cummins, Leyland, Kirloskar and Shaktimaan. We have inhouse facitlity for machining of diesel engines plus trained engineers for overhauling the same. We also provide backup support through trained service engineers as and when required. From Mejor overhauling to minor repairs, we assure quality at every step. We provide quality technical work with genuine spare parts. Repair, maintenance, and overhauling; either done in our service centers or on-site services, our standards of quality remains on the peak. - Fabrication & erection of Lube Oil Piping System for M/s Action Ispat Ltd.
- Expert services for 33/77/150/165 MW TG sets for M/s Bhushan Steel Ltd.
- Manpower supply for Turbo Blowers for M/s Euro Ikon Industries Ltd.
- Inspection of steam inlet strainer in 35 & 5.6 MW turbines at M/s Hindalco Industries Ltd.
- Deputation of Specialist for M/s Hindustan Copper Ltd.
Raj Gentek is a well-known service provider of overhauling of all kind of Diesel Engines in Delhi NCR, Faridabad, Chandigarh and Jaipur since 1998. We use advanced techniques and make sure to replace defective parts with original ones. We complete the work within the time period.